A truck is pulled from a pond after a crash with an SUV along Southlake Boulevard, Aug. 8, 2018. 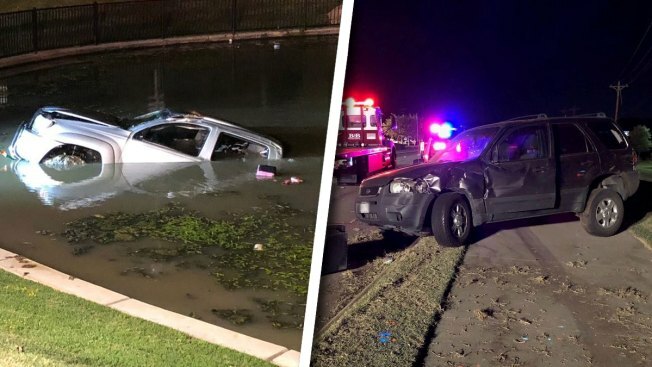 A North Texas woman is facing a charge of driving while intoxicated after hitting another driver early Wednesday morning before crashing into a pond. At about 12:40 a.m., two vehicles traveling east on Southlake Boulevard collided, police said. The first vehicle, a pickup driven by Taylor Berlingeri, lost control and sideswiped the other vehicle, driven by Hayley Hollenga, according to police. Berlingeri's pickup ending up crossing the median into oncoming traffic and going airborne after entering a flowerbed before coming to rest in a small pond, where her vehicle began to submerge. Taylor was able to swim out of the vehicle; officers found her walking Southlake Boulevard. Both women were arrested after the investigation and charged with suspicion of driving while intoxicated. No other individuals were harmed during the incident. Fortunately, Taylor was able to swim out of the vehicle, and officers found her walking down Southlake Boulevard.